I don't usually do New Year's resolutions and I would not say this is one, but I am publicly declaring that I am serious about getting healthy. I am not terribly overweight, but I am terribly out of shape. I have let my back and foot problems be my excuse to stop exercising for some time now. I do like to swim, but our community pool is outdoors and I am not willing to pay for a gym membership just to use their stinky indoor pool. So, I have not exercised since October, when our pool closed for the winter. In October, I met up with my friend, Lulu, and she told me how she had been feeling just awful and also was having some other health problems and decided to get serious with her diet . She started with the Whole 30 in the summer and has continued and feels great. She said she has never felt better. I made a decision to do this but seriously needed to wait until after the holidays when we would have lots of family around. I needed to get my head around this new way to eat and I wanted my husband on board too. I have some auto-immune problems and this life style eating plan is supposed to help rid your body of inflammation which can cause a lot of the pain I have been experiencing. So it's a new year and we have a new diet. Paleo. The Whole 30 is the cleanout plan for 30 days. You rid your diet of all grains, legumes, alcohol (UGH!) sugar, preservatives and lots of other things. What do you eat? Lots of healthy, fresh, organic vegetables; organic eggs, meats and fish; fruits and healthy fats. I know we are just two days into it, but I am excited. It means more work for me. Meal planning and grocery shopping. But, we're worth it, right? 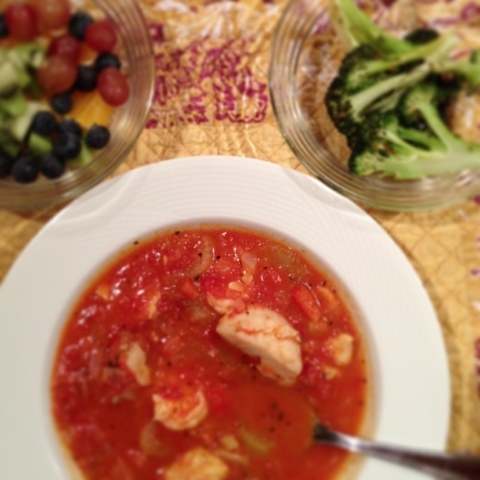 Yesterday I made this fish stew. I changed it up a bit because the combination of cinnamon and cumin with fish sounded nasty. Instead, I used a teaspoon of dried oregano, a bay leaf and a fresh sprig of rosemary. I also swapped out the swordfish for cod. It was delicious. It tasted like a lighter version of a French bouillabaisse. A small fruit salad and some roast broccoli rounded out the dinner. Tonight I made a chicken creation of my own. Another French inspired dish. With some sauteed spinach and butternut squash roasted with ghee, it was another hit. So far we are 2 for 2. Season the chicken with salt and pepper. Heat the coconut oil in a dutch oven until melted and hot. Add the chicken and brown well on all side. Add the rest of the ingredients and stir well. Place cover on the pot and bake in the oven at 350'F for about 45 minutes. Remove lid, stir and continue to bake, uncovered until well browned and the chicken is done, about another 45 minutes. There will be a lot of "gravy". Thicken the gravy with the arrowroot mixture. This was so good. I hope you try it. Now the exercise part. I am doing a plank a day to strengthen my back. My goal is to be able to get passed the 2 minute mark. Now mind you my first day was a measly 37 seconds! But, I figure I will spend this month strengthening my back and then I will get serious about more exercise. Wish me luck, I'm going to need it. But I am happy to have my husband eating the same as me. That makes it so much easier. since I declared my intentions for at least the next 30 days...I might need you to keep my honest. I'm on Paleo, too. It's day five for me. Good luck: sounds like something I need! Sounds good, but like I'd never convince three others along for the ride. I'm with you on the lose weight and strengthen the back thing totally. I need this lot out the house, but I've already been testing out the plank. Good luck! I have heard the paleo thing is supposed robe very good for you! It looks like you are already doing great Di and I know you can do it. Your food looks lovely and good for you for embracing a new you. I start next week - it is going to be tough but definately on for some mutual cheering! Hi honey, just offering support here! My man and I have been mostly Paleo since August, I say mostly as I will happily indulge in wheat and french cheese when eating out! Good luck! It sounds like quite a challenge for the first bit, but hopefully that adjustment phase will go quickly and you'll be a Paleo-planking champ in no time! The chicken looks delicious! Congrats on your decision! I'm in the same place...I'm not overweight, but my eating habits were horrible! Chips for lunch...hello!! And my exercies was hit and miss. So I joined Weight Watchers on-line and am working out twice a day. Even though it's only been since Jan. 1st...I feel amazing. I'm cheering you on! So glad you shared...I haven't yet on my blog, but you've inspired me! Congratulations - and I can't wait to see how you do...I think I may need to follow in your footsteps!! Good for you Di! I know you can do it. John and I start our diet Monday. I'm back to phase 1 of South Beach on Monday after a horribly bad for me December, which I'm intending to keep going for a month, and I'll be back to walking to work again on Monday. Unfortunately from February I'll have to drive to the new job, but I do have to effectively drive past the gym on the way home, so that's where I'll be diverting to! Well your dinner looks delicious! Good luck to you - the plank sounds like something I should be doing for sure! Your diet sounds like the one I started on Jan 2. Nothing fun but lots of healthy stuff. It works, and I am sitting here on my computer while the soup stock that I am making is burbling. You and I will both be trim and fit in London, I hope. But what is this plank thing, I see others mentioning it. Good luck with the new regime. I know you can do it especially with Paul's help. I would like to know about the plank thing too. I need to do something for my back too. Like you swimming is good in summer, but I won't go to the local smelly municipal pool in winter. My adult daughter has severe RA and her rheumatologist has recommended this eating plan to for her. I am very interested in it, and hope you'll continue to blog about your journey with it. I'm going to follow that link to learn more about it.